How important is outdoor play for children? Aside from the opportunities to use gross motor skills while running, riding a bike, swinging on swings outdoor play for children is FUN! Unstructured outdoor play provides a much needed outlet for stress (yes, young children experience stress) and is a great avenue for children to move their bodies and raise their voices in ways that are not appropriate while indoors. Especially for children under the age of eight, learning occurs best when the whole self is involved. Outdoor play provides an ideal platform for uniting the body, mind and spirit in the carefree expressions of childhood. Although a recent report from The American Academy of Pediatrics says that children should play outside for at least 60 minutes a day, another study from The Archives of Pediatrics and Adolescent Medicine states that almost half of three to five year olds don’t play outside on a daily basis. Providing young children with the foundation and support they need is key for building and maintaining strong communities. As an educator in the field of Early Childhood and Human Development for nearly 30 years, I have seen the positive impact that well-educated family child care providers can have on a child and their family. Rio Salado College student Sharnet Parker’s lifetime goal has been to provide quality care for children and families. Parker saw her goal become a reality and currently owns and operates Rising STARS Preschool and Childcare center in Chandler, Arizona. “While raising my own two boys, in 1996 with the support of my husband and family, I fulfilled my dream by opening my family child care business,” Parker said. She credits Rio Salado for providing educational and professional development support for her career. Parker has earned her Academic Certificate in Professional Development and is working toward an Associate of Applied Science in Early Childhood Education. More than 5,000 students currently take Early Childhood and Human Development classes at the college. Rio offers seven certificate and three associate degrees in Early Childhood and Human Development. The program provides a variety of pathways in online formats; infant/toddler, preschool, school age (after school programs), adolescence studies, family life education, adult development and aging and management of early childhood environments. The college also works directly with employers to bring selected courses to the workplace. This next week, April 22 – 28, the National Association for the Education of Young Children (NAEYC) will be celebrating Week of the Young Child. As noted by NAEYC, the purpose of the week is to “focus public attention on the needs of young children and their families and to recognize the early childhood programs and services that meet those needs.” Rio Salado College will celebrate the week by participating in a community event in Buckeye, and by hosting the Fifth-Annual Early Childhood Director’s Conference on April 21. Check out the latest issue of Rio Salado College Magazine . Print copies are now available at news stands throughout the Valley. At Tempe-based Rio Salado College, going green is more than just a marketing slogan. The college takes a broad view of its environmental responsibility and has integrated sustainability as a core value within the culture of the entire organization. Rio provides access to 31 courses that deal with the social, cultural, ecological and economical elements of sustainability and offers an academic certificate in Sustainability and Ecological Literacy. Students can also choose a degree or certificate in sustainable food systems. To further illustrate its commitment, the Rio Salado Sustainability Pledge is included in the program for the school’s GED graduation and college commencement ceremonies. It’s not just a matter of teaching others how to be sustainable. Rio Salado strives to be a leader in environmental responsibility by incorporating earth-friendly practices throughout its daily operations. 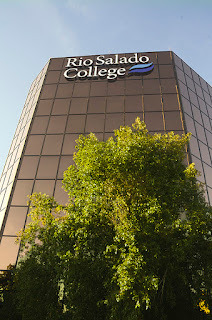 Rio Salado became a charter signatory to the American College and University Presidents’ Climate Commitment in 2007 by vowing to reduce the carbon footprint of the institution and seek climate neutrality. In support of that goal, the college released its Climate Action Plan in 2008. Since then, Rio has earned a Silver Rating for Sustainability from the national Sustainability Tracking Assessment and Reporting System. The college has also fostered collaboration among institutions of higher education through participation in the Association for the Advancement of Sustainability in Higher Education (AASHE), and the Continuous Quality Improvement Network (CQIN). 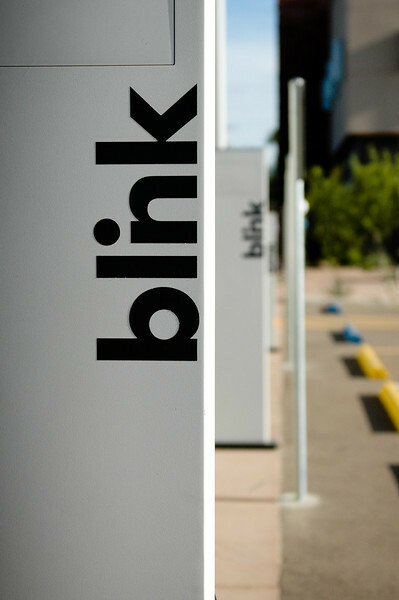 Rio’s commitment to sustainability is evident in nearly every aspect of the planning, construction and maintenance of its new downtown Phoenix location. “We are pleased to work and partner with a number of community leaders and organizations to make the vision of Rio Downtown and its focus on sustainability a reality,” Bustamante said. During construction, over 90% of all construction waste was collected and recycled. The building has several energy saving features including LED lighting, native and low-water use landscaping and an innovative grey water system that reduce the use of potable water for irrigation, and highly calibrated CO2 sensors that maximize energy efficiency and indoor air quality by limiting outdoor air intake when carbon dioxide levels are acceptable. As part of the Maricopa Community College District, Rio Salado is also helping establish crucial infrastructure for the next generation of transportation by making electric vehicle charging stations available to the public at its satellite locations throughout the valley. The Student Public Policy Forum (SPPF) is a two-semester academic program that provides an overview of local, state, and national public-policy making. Participants will learn the importance of civic responsibility and the value of citizen advocacy. The 2012-13 SPPF is presented in a hybrid format utilizing in-person and online elements to provide students with an up-close understanding of how government works. The experience culminates in a trip to Washington, D.C., where students have the opportunity to lobby members of Congress and their staff on important issues in higher education. Through participation in SPPF students will . . . The SPPF application deadline for the 2012-13 school year is Friday, April 27, 2012. For more information about the Student Public Policy Forum visit the Rio Salado College SPPF webpage. "Great to see you Jordan!" calls a volunteer, as Jordan Moon sits down at his office cubicle at Sun Sounds of Arizona. "Yeah, good to see you too, Ben," he replies. Moon is speaking metaphorically. Like many of the 49,000 people who use the statewide radio reading service, he is blind. A senior at the Walter Cronkite School of Journalism, Moon spends several hours a week as an intern in the marketing department of Sun Sounds. As one would expect, he performs the typical intern tasks – writing on-air promotions, feature stories, newsletter articles and press release for the state-wide radio reading service. But Moon will tell you that this particular internship is one that has given him "great vision." "Because of my internship, I can clearly see my future. I want to help people who are like me," he said. And Moon has proven that he has the leadership potential and innate passion to make that goal a reality. 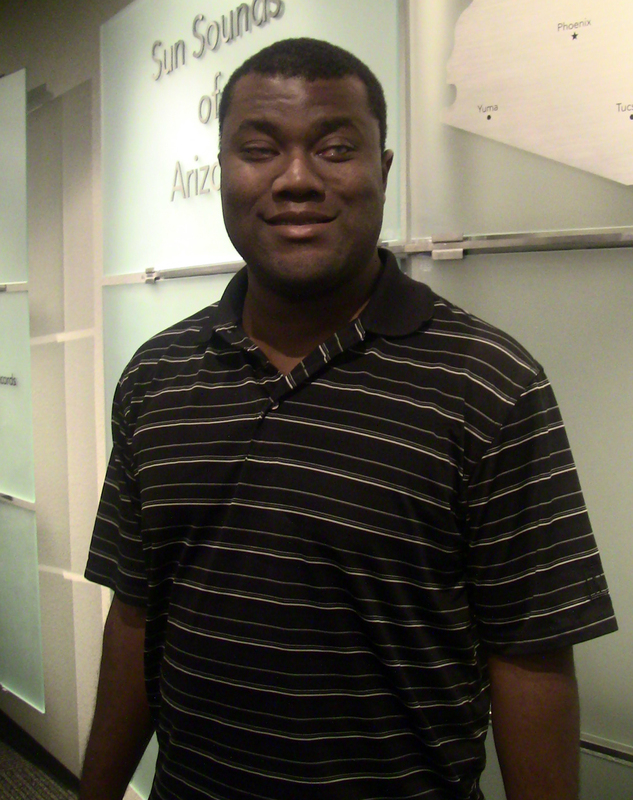 In 2010 he co-founded Ability Counts Tempe, a disability awareness student group at ASU designed to promote social interactions between students with disabilities and the general ASU community. Since Moon started his internship in January he has emphasized marketing Sun Sounds’ radio reading service to a younger, more technology-savvy audience. While a majority of listeners are over 60 years old, and listen to Sun Sounds on a special radio, Moon demonstrates how a younger generation that is familiar with smartphone accessibility might use the service. On his smartphone Moon opens the free iBlink Radio app, touches the "radio reading service" menu item, and then touches "Sun Sounds of Arizona Tempe." Instantly, the live radio broadcast begins to play. Sun Sounds of Arizona, a community service of Rio Salado College, serves people living with disabilities that make it difficult to read print. Volunteers read newspapers, magazines, and other periodicals aloud over the radio, internet and telephone. The organization promotes accessibility as one of its core values. Staff, volunteers, and student interns alike have equal access to resources. Moon and others with visual impairments use screen reading computer software for office productivity and internet access. The radio broadcast software that controls all on-air programming is screen-reader friendly. Staff and volunteers are alert for walkway obstructions or unmarked hazards that could trip a person with a visual impairment. Internships at Sun Sounds expose students to many aspects of broadcasting, social service and education radio reading service, and it also serves the organization. "Part of what we do is to teach our colleagues that people with visual disabilities are not unlike the rest of us. They use smartphones, they download apps, and they say ‘See you later’ just like I do," says Heidi Capriotti, Marketing Coordinator at Sun Sounds. Moon will graduate in May with majors in journalism and political science, and intends to pursue a law degree. During his college career Moon’s articles have been published in the Arizona Republic, Arizona Capitol Times, Tucson Daily Star and ASU’s State Press. Moon is now in the process of looking for a job and is interested in many areas, including music, journalism, politics, law, teaching and public relations. "But whatever I do," he says, "I want to make sure that I do it in the same manner as the staff and volunteers at Sun Sounds – with care, professionalism and passion. Hard work for the sake of helping people is inspirational and I now see as my clear path." KJZZ’s Fronteras: the Changing America Desk has won its first national award for reporting. The National Headliner Awards are among the oldest awards of journalistic merit in the United States. The story by KJZZ Senior Field Correspondent Michel Marizco, "The Drug War and Cartels Lead to an Exodus in Northern Mexico," was broadcast in June 2011 and can be found online at fronterasdesk.org. KJZZ’s Marizco traveled to the Mexican state of Sonora to report on the towns that are emptying out due to drug-related violence. The town of Tubutama, in particular, has been affected by a narco-trafficker known as "El Gilo." Marizco spent time with the remaining residents of Tubutama, a 300-year-old mission town, and even found himself face-to-face with El Gilo. "Any time a local drug lord shows up and talks to you on a piece, you know it’s going to be a great story," said Fronteras Senior Editor Alisa Barba, who edited the story and shares in the award. Marizco has a habit of showing up at the right place and the right time, Barba said. "He really got to the essence of the fear and the violence in the hills of Sonora." The Tucson-based reporter said he wanted to do a story about the places affected by the drug war that aren’t making headlines. "This town had always interested me because a year prior El Gilo had successfully killed cartel members. He left 21 people dead and destroyed their vehicles in an ambush," Marizco said. Photos of those shot-up vehicles are part of the online version of the story. "Nobody else is telling these stories," Barba said. "This is our territory with Fronteras." The story was awarded second place in the Feature and Human Interest Story category for broadcast radio networks and syndicates. KJZZ’s Fronteras: Changing America Desk is part of an unprecedented collaboration among seven public radio stations, led by a partnership between KJZZ and KPBS in San Diego and funded by the Corporation for Public Broadcasting. Fronteras serves nearly one million public radio listeners in the Southwest. It is one of seven new Local Journalism Centers funded by the CPB to provide innovative approaches to news gathering and distribution. To learn more about the KJZZ’s Fronteras: Changing America Desk, visit fronterasdesk.org. KJZZ is a listener-supported public radio station that is licensed to the Maricopa Community College District. It is as a community service of Rio Salado College’s Division of Public Service, which also includes KBAQ 89.5 and Sun Sounds of Arizona. KJZZ features a mix of local and NPR news, entertainment, jazz and blues—serving more than 306,000 weekly listeners. For more information, visit kjzz.org. Rio Salado College’s Sustainable Food Systems certificate and degree programs provide students with an understanding of the concepts behind the real food movement. Even students with no culinary background can benefit from learning about the nation’s current food model and alternative methods for producing, purchasing and bringing meals to the table. The sustainable food systems programs are offered in a hybrid format. Online courses like FON143 Food and Culture explore the historical, religious and socio-cultural influences on the development of local cuisine and eating customs. In-person instruction is required for courses like AGS182 Gardening Practices and Techniques or CUL113 Commercial Baking Techniques which incorporate hands-on experience in the Garden at Rio and Café at Rio live learning labs. Michael Hodgins, sustainable food systems director and advocate for the real food movement said he believes it’s important to encourage future chefs to create their menu with local in-season ingredients. Find more information on the sustainable food systems certificate and degree programs on the Rio Salado College website. 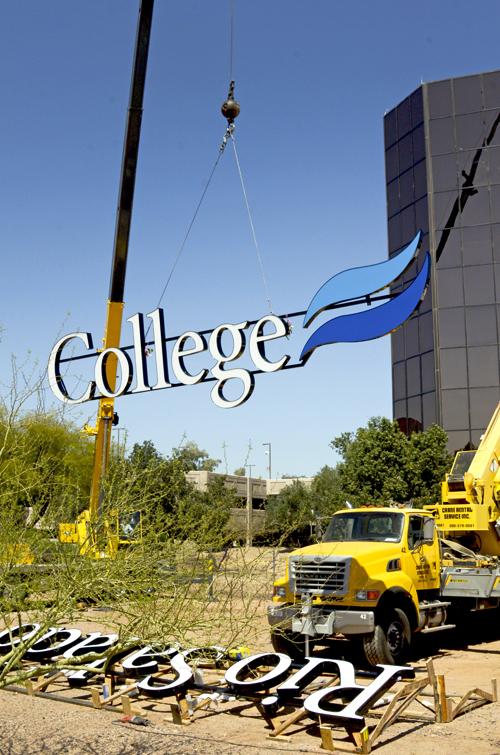 The Tower building at Rio Salado College’s Tempe headquarters has a new look. The illuminated sign on the building’s south side, which is visible from the US 60 and Interstate 10, was updated this week to reflect the school’s current logo and branding. 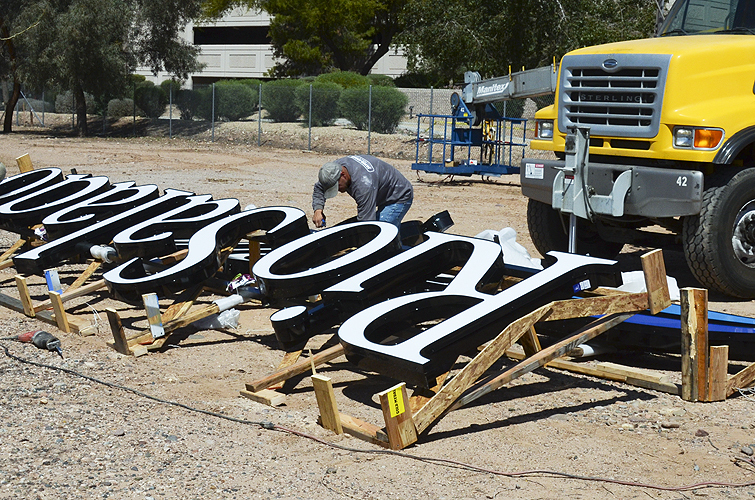 Replacing the sign has been a wish list project for the Rio Salado marketing team since 2008 when the new logo was introduced. Cost concerns and a statewide trend of education budget cuts delayed the project for several years, but as the age and condition of the previous sign raised questions about safety, the college moved forward to replace it. Arrow Signs manually removed the old sign on Thursday using a 130’ lift. Installation of the new sign was completed on Friday and Saturday.